“Kafka, Fascism, and Family in Modern Italian Literature,” Hebrew University, Jerusalem, April 19th, 2017. “Kafka as Detective Novelist? : The Italian Case, from Carlo Emilio Gadda to Paola Capriolo” for the panel “The Kafkaesque in German Literature, Film, and Culture (1933-present)” at SAMLA (Southern Atlantic Modern Language Association) in Durham, NC, November 2015. Emilia Galotti as a Galeotto: Whose Go-Between? “Emilia Galotti as a Galeotto: Whose Go-Between?” for the panel “Universal and Particular in Lessing,” MLA Vancouver, January 8th-11th, 2015. “Kafka Leaves Home: Das Schloss, Il castello, The Castle and World Literature,” for the panel, “Kafka’s Das Schloss as an Axial Work of Art,” German Studies Association Conference, Kansas City, Missouri, September 2014. 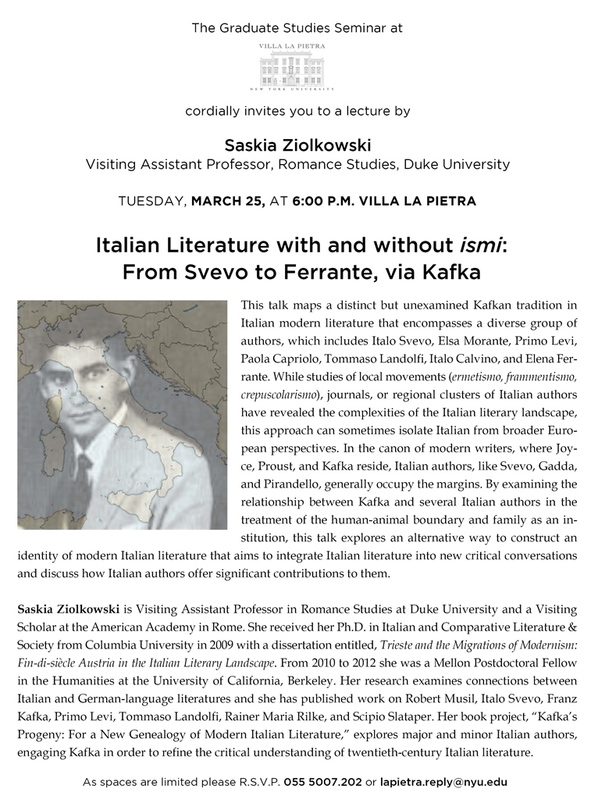 “Parental Bonds: Kafka and the Family in Modern Italian Literature.” Interstitial Italy: Reassessing global questions through the ‘peculiar’ Italian case. SIS Interim Conference 2014. The British School at Rome. March 27th-28th, 2014.